Blackjack, also known as Twenty- One, is a popular casino game found throughout the world. It is a banking game in which the aim of the player is to achieve a hand whose points total close to 21 than the banker’s hand. The rules are easy, the play is supreme and there is the opportunity for high strategy. This is the perfect game for the expert player understanding blackjack etiquette, who prefers to play a mathematical game. Even though the majority of players are not skilled enough to win most of the time, the belief that it can be beaten was enough to spark interest in the game. The secret is to learn the basic strategy for hitting, standing, doubling down and splitting pairs. The standard 52-card pack is used, but in the major parts of casinos several decks of cards are shuffled together. Cards 2 through 10 are worth their face value while the Kings, Queens and Jacks are worth 10 each. Aces may be counted as 1 or 11. The goal of each player is to attempt to draw cards as close to 21 as possible, without going over 21. The best case scenario is a two-card 21, or a blackjack. However, if the dealer also has a two- card 21, the hand pushes, or ties, and you go back to the original bet. The game is normally played at an arc-shaped table and kicks off with you making a bet. At one corner you will find a note that says the minimum and maximum bets at the table. Once the bets have been placed, the next step for players is to play out their hands. Then the dealer plays according to the rules: draw cards to any total of 16 or less and must stand on any total of 17 or more. Hit: If you hit you take another card with the hope of getting closer to 21. If a player exceeds 21 after hitting, the player is said to bust and loses the bet. Verbal calls to hit are not accepted! Stand: To ‘stand’ in Blackjack is to hold your total and end your turn. If you go over 21 you bust, and the dealer wins regardless of the dealer’s hand. If you are dealt 21 from the start, you got a blackjack. Split: Very often, when you are dealt a pair, you have the option to split them into two new hands. You are dealt two more cards and your bet is doubled. Players have two chances to beat the dealer, if not they lose. Double down: A player is allowed to increase the initial bet by up to 100% in exchange for committing to stand after receiving one more card. The extra bet is placed in the betting box next to the original bet. Insurance: This is a side bet that the dealer has blackjack and is considered separately of the main wager. It pays 2:1 and is available when the dealer has an ace up. 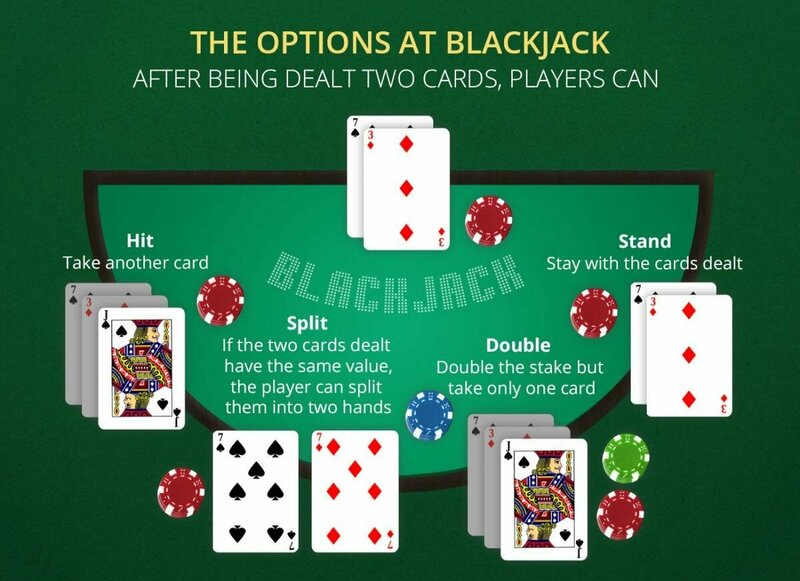 Many dealers suggest players to take insurance if the player has blackjack. However, strategy guides tend to give advice against taking insurance.